In 1960 the “city” of Abu Dhabi was nothing but dust and sand and a few thousand fishermen and pearl divers on the shores of the Arabian Sea. Today, amid the steel and glass, the Ferraris and Escalades, it’s easy to forget that older, forgotten village—except for tucked away patches like the fish market. 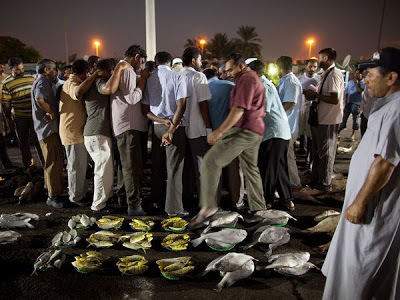 Fresh fish is auctioned off before dawn to vendors and restaurants in Abu Dhabi. Dozens of graceful wooden dhows crowd the wharf, built as they have for centuries with high sterns and low, curving sheer lines. Boats come and go daily, piled with stacks of wire fish traps, each usually spending a few days at sea before returning with their catch early in the morning hours before dawn. It’s an ageless ritual, the catch laid out in small baskets in long, perfect rows and columns on the docks. Crabs and grouper. Barracuda and kingfish. Tuna and small sharks. An auctioneer walks down the rows, followed by a crowd of fishermen and buyers, calling out prices and purchases in a fast singsong. As the sun rises, the action shifts to the cool, tiled inside of the market proper, where the local catch is joined by others from throughout the Gulf, and Indian fishmongers in hairnets call out their wares, a lovely smorgasbord of silver fin and tail and eye. Outside, the dhow crews wash up around buckets in the hot afternoon sun and sit around piles of rice and curried crab. A hungry visitor has two choices: Befriend the crews and get invited to a rustic lunch or buy a fish and have it cleaned and cooked at one of the stalls at the market’s edge.